Rep. John Lewis (D-Ga.) speaks about Hillary Clinton Feb. 11, 2016, while flanked by members of the Congressional Black Caucus during a news conference at the Democratic National Committee headquarters in Washington, D.C.
Rep. John Lewis, civil rights icon, lawmaker and Hillary Clinton supporter, intentionally or unintentionally called out Vermont Sen. Bernie Sanders’ civil rights bona fides Thursday. 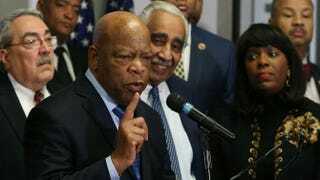 Lewis, who was among several members of the Congressional Black Caucus to endorse Clinton’s presidential bid, was asked whether Sanders’ involvement in the civil rights movement swayed him. It did not. Sanders, who has been a member of Congress since 1991 and a senator since 2007, hasn’t exactly had the warmest relationship with the CBC. In fact, it’s been largely nonexistent. There’s a good chance that Lewis probably hasn’t “met” him, if “met” means asked him for help or had Sanders offer some help, congressman to congressman. And while “Bernie Bros” bashed Lewis and pointed to Sanders’ past as a supporter of the civil rights movement, others are picking that apart. Is that photo of Sanders in college organizing among other activists even Sanders? Probably not. Is that other photo from Selma Sanders? Snopes says nope. But the Sanders campaign insists: He was involved. Sanders did participate, but he’s not helped by the legion of white people over 60 who swear they marched with Martin Luther King Jr. Mitt Romney famously was caught in a gaffe in 2008 when he mistakenly said his father, George Romney, marched with King. These would-be, wannabe civil rights trailblazers are an insult to those—white and black—who actually did risk life and limb for the freedom of black people. They’re annoying, and the claim happens so often that my 74-year-old father, who vividly remembers the 1960s and all the crazy that entailed, jokes that those old, iconic Ebony magazine photos and film reels should be nothing but a sea of white people. The war should have been won overnight if that many conscientious Caucasians were in support of it. This is the conceit Sanders is up against. “I supported the civil rights movement in the 1960s” is up there with saying, “I have a black friend” and “I don’t see color” to black people. As in, it sounds like bulls—t. Black people would hope you supported the civil rights movement (I mean, really) and that you would have “a black friend” if you claim to be any sort of liberal or progressive who is anti-racism, but what have you done for black people lately? These are bare-minimum things. And stop saying you don’t see color! Everyone sees color. How else would you know your black friends were black? Sanders, who is garnering black support of late for his economic policies, is an attractive candidate for black America, but his interest in black America post the civil rights movement is relatively recent. He’s the senator from Vermont, after all. It’s not as if he had to worry about the black vote there, so of course he hasn’t met with the CBC much. Of course, before running for president, he didn’t talk about race. Of course, there is this whiff about him where it seems like Sanders just discovered black people a few months ago when he realized that Democrats need upward of 90 percent of the black vote to keep the White House. That’s what Sanders is really up against. Clinton is a known entity. While she was once against Obama, she is now for continuing and improving upon what he started (if that means you will please, please vote for her, black people). Clinton is one we know we can talk to and yell at and protest against and throw fits upon and even burn in effigy if it gets really bad. We know what we’re getting into when we climb into her (and Bill’s) political bed. Bernie “I might have done some civil rights stuff 50 years ago” Sanders is an unknown entity, so he has a tougher row to hoe. There’s more scrutiny. There are more questions. More demands for receipts. But that doesn’t mean he can’t win our support or our vote. But he’s probably not going to get John Lewis’.